Bollitos de Maíz (Boiled Cornmeal Dumplings) is one of our humble foods, a comfort food, something few visitors to our country get to experience. This past week one half of our family gathered at a local resort as we do almost every year. It is a time for relaxation, catching up, and on the practical side of things getting everybody together under the same roof, so to speak. We hope some day we’ll have a home large enough to accommodate our whole family without having to resort (pun intended) to what I called on my Facebook wall “my personal hell”. That comment sparked a very funny exchange and on Twitter, some baffled, and some not so sympathetic replies. So instead of shutting up now while I am still ahead, I will dig in my heels and claim that yes, I do dislike resorts. In fact I am no fan of hotels in general. This opinion will probably not make me the most popular person where I live, the quintessential resort area. I will take my chances. The thing is, hotels bore me almost half to death. I love traveling, and accept that hotels are vital to the experience, but to me they are simply a safe place to return to at the end of a day of discovery and excitement. A whole vacation of unlimited drink and food, and toasting my skin nearer to a melanoma is not my definition of fun (hey, I already have a built-in tan!). You are entirely free to disagree. What don’t I like about resorts? The environmental impact, the waste, the isolation, the impersonal and industrial feeling of it all. Give me a road and I will end up in some cabañas by the beach and some mom’n’pop restaurant in a town somewhere. Give me a vacation of discovery, people, places, something most resort tourists don’t get to experience. If you don’t speak the language can you even tell in what country you are? Does it even matter? Certainly not to the drunken sap who spent his days by the poolside bar, and carried away to his room each evening by the staff. I decided to make the most of it and worked every day. It’s the advantage of my job. I got some writing done and with a lovely view I must say. That is until a couple of duffers tried to assassinate me with a golf ball. I quickly moved my business inside. So my dear friend. Come visit us, we really love visitors. Really, we do. We are friendly, it’s in our nature. And please do get out, know the country a bit. We have so much to offer. Come eat the food you’ll never see at resorts. Don’t leave without trying the food we love, like these Bollitos de Maíz (Boiled Cornmeal Dumplings). But, if you are just interested in killing your brain cells with our most excellent rum, or toasting your skin to a crispy melanoma under our clear blue skies, then by all means, don’t step out of the resort. At least their food is good. Bollitos de Maíz Recipe (Boiled Cornmeal Dumplings): Craving some comfort food? This humble dish can be served as a side dish or in our beloved sancocho. 2 tablespoons of butter (or vegetable oil). Mix cornmeal, flour, water, sugar, salt and butter. Mix well with a spatula. Take two tablespoons of the mix and form into dumplings, squeezing to compress them. Repeat with the remaining dough. Heat broth until it breaks into a rolling boil. Pour in oil and lower the heat to medium. Using a slotted spoon, place the dumplings gently into the broth one by one. 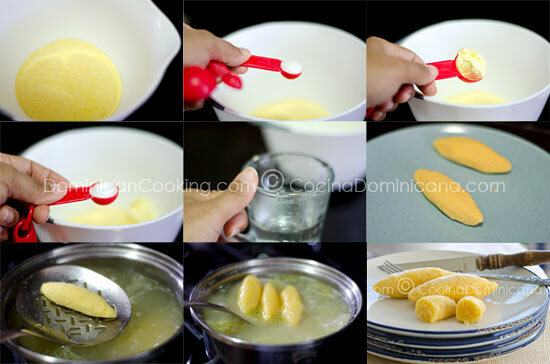 Cook for 35 minutes or until well cooked inside (if you are going to use them for sancocho, skip this step and just add them uncooked to the preparation at the point in which you add the plantains). Add water as needed to maintain the same level. Serve hot with pollo guisado or arenque guisado. If you want a gluten-free version use more cornmeal in lieu of the flour (for a total of 2 cups of cornmeal). This may require a longer cooking time. For a vegan dish use vegetable oil in lieu of butter. MY BACKGROUND IS DOMINICAN BUT I WAS BORN IN MANHATTAN NEW YORK; MY PARENTS TEACH ME EVERYTHING ABOUT THE DOMINICAN REPUBLIC I USED TO GO EVERY SUMMER TO THE DOMINICAN REPUBLIC I I LOVED IT I KNOW THE ENTIRE CITY I USED TO TRAVEL ALL AROUND THE CITY IN MY CAR ITS THE MOST BEAUTIFUL COUNTRY I HAVE SEEN EVERYTHING IS SO UNIQUE I JUST LOVED IT. AND THE FOOD ITS SOOOOOO DELICIOUS THANKS FOR YOUR RECEPIES ON THE AREPITAS DE YUCA I LOVED IT AND MY KIDS LOVED IT TOO. Clara it´s true what Richard said, that was the way my Grandma used to cook it. She also added grated coconut and coconut milk, and that was ¡great!! !